Our fudge is not that overly sweet, grainy, flavorless confection you have been led to believe is fudge. It is not your average fudge. There are no preservatives, corn syrup, Karo syrup, or cups of sugar added. We do add more chocolate though! Sounds crazy, but we think fudge is chocolate first—all the other flavors complement the chocolate experience. It’s a dark, rich, creamy and flavorful confection that will melt in your mouth. 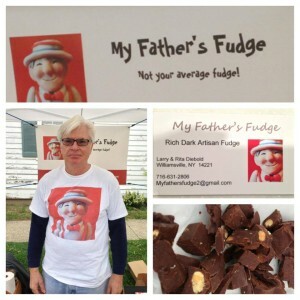 It is actually…my father’s fudge. On special occasions, my dad would create his favorite and only flavor, peanut butter. Read more about us at myfathersfudge.com.